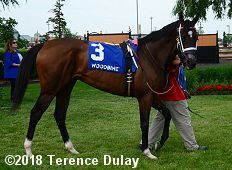 Saturday at Woodbine, the two major local preps for the Queen's Plate Stakes, the first leg of the Canadian Triple Crown, were contested over the Tapeta main track. Conditions were excellent at the Toronto oval next to Pearson International Airport, with partly cloudy skies and temperatures in the mid 70's. 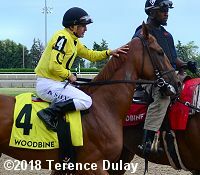 The highlight race of the afternoon was the $500,000 Budweiser Woodbine Oaks, featuring top Canadian-bred 3-year-old fillies going 1 1/8 miles. Just 5 faced the starter, with Wonder Gadot sent off as the prohibitive 3-10 favorite off second place finishes in the Fantasy Stakes (G3) and Kentucky Oaks (G1). 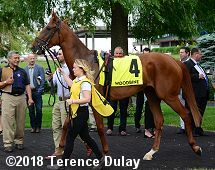 In to challenge her included 3-1 second choice Dixie Moon, 2nd in the Selene (G3) after finishing 9th in the Appalachian (G2), and 8-1 third choice Hot Cash, still a maiden making her 5th start here off a 3rd place finish at Belmont. Due to the short field and the low odds on Wonder Gadot, show wagering was not available. Down the stretch with Dixie Moon on the inside and Wonder Gadot on the outside. Jockey Jeffrey Alderson sent 20-1 Fairy Hill to the lead first time by and she set slow fractions of 25.16, 50.27, and 1:14.07 while pressed by Dixie Moon and stalked by 28-1 Queen's Fate, with Wonder Gadot 3 wide in 4th. 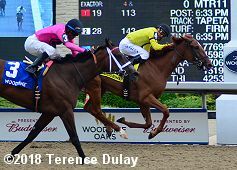 Turning for home, Fairy Hill tired as Dixie Mooon and jockey Eurico Rosa Da Silva gained the lead through 1 mile in 1:38.00. Jockey Patrick Husbands moved Wonder Gadot 3 wide for room and asked her to rally but Dixie Moon held her off to win by a head in 1:50.38. It was a long 7 1/4 lengths back to Hot Cash third. Left: Dixie Moon in the winner's circle. 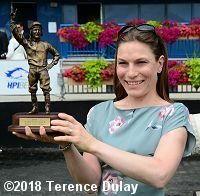 Winning trainer Catherine Day-Phillips said, "That was a crazy stretch run. She had a nice, clean trip and she just gave it her all. Her biggest strength is in her heart. She's just a lovely filly. Eurico had her in a good position. She just gave it all today." Right: Jockey Eurico Rosa da Silva celebrates with the trophy. Left: Dixie Moon in the paddock before the race. Winning jockey Eurico Rosa da Silva said, "My plan was trying to relax her as much as I could and she was running very, very relaxed. I was sitting in a great position and the pace was not that fast. I pushed her a little bit early because I knew she was going to have a good finish. In my mind, I knew [Wonder Gadot] is going to come. And Patrick was smart, he was watching me and she came and both horses ran fabulous races. They put on a great show, these two horses." Right: Dixie Moon in the post parade. Left: Second place finisher and beaten favorite Wonder Gadot in the paddock. 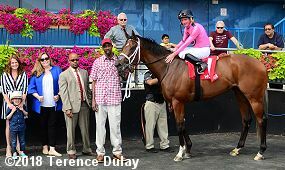 Jockey Patrick Husbands said, "She was real bad with the pony so I had to walk her warming up. She broke flat-footed, and walked out of the gate, so we had to try to get back within striking distance. But she ran a good race." Right: Third place finisher Hot Cash returns after the race3. 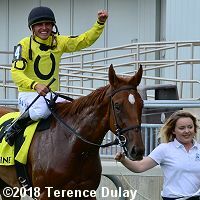 The James Jerkens trainee improved her record to 0 wins, 0 seconds, and 2 thirds in 5 starts, earning $54,745 for owner-breeder Stronach Stables. 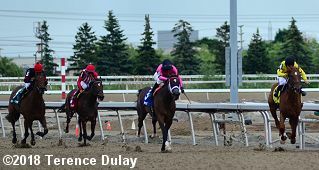 One hour before the Oaks, a field of 7 Canadian-foaled three-year-old males also went 1 1/8 miles in the $125,000 Plate Trial Stakes, the major local prep for the Queen's Plate to be run in 3 week's time. Telekinesis was sent off as the 2-5 favorite exiting a close second place finish in the Lexington (G3) at Keeneland. 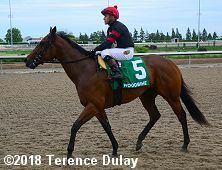 In to challenge him included 7-2 second choice Silent Sting, winner of the Queenston Stakes, and 15-2 Aheadbyacentury, last year's Coronation Futurity winner and 3rd in the Marine (G3). Jockey Patrick Husbands sent Telekinesis to the lead first time by and he set fractions of 25.06, 49.66, and 1:13.31 while pressed by 23-1 Rose's Vision and stalked by 9-1 Scrapper. Entering the lane, Rose's Vision moved up to challenge through 1 mile in 1:37.61, but Telekinesis turned him away to win by 1 3/4 lengths in 1:50.40. It was another 4 3/4 lengths back to Aheadbyacentury third. 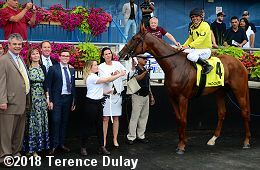 Left: Telekinesis in the winner's circle. 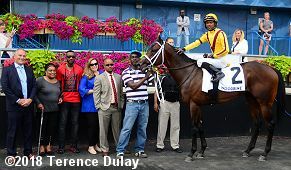 Jockey Patrick Husbands said, "He was traveling so easy. By the time I left the gates, he had one ear back and one ear forward. That's the sign that a horse is very comfortable under you. By the three-quarter pole, he still had one ear forward and one ear back. It told me he was just playing with that horse. Down the lane, I squeezed him a little bit. He did just enough to win the race." Right: Telekinesis takes a drink while getting hosed off after the race. Left: Second place finisher Rose's Vision returns after the race. 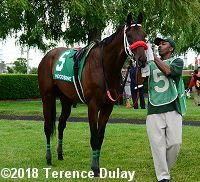 The Stuart Simon trainee improved his record to 2 wins, 3 seconds, and 1 third in 9 starts, earnng $123,848 for owner-breeder Chiefswood Stables. Right: Third place finisher Aheadbyacentury in the paddock before the race. The John Ross trainee improved his record to 2 wins, 0 seconds, and 3 thirds in 7 starts, earning $184,075 for owners Jack of Hearts Racing and J.R. Racing Stable. 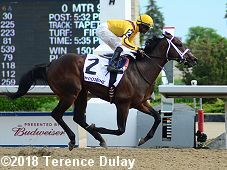 Kicking off the stakes action on Sunday was the $100,000 Alywow Stakes for 3-year-old fillies sprinting 6 1/2 furlongs on the firm (GoingStick 11.0) E.P. Taylor Turf Course. 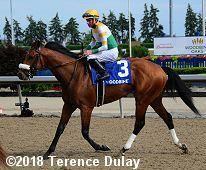 Road to Victory was sent off as the 6-5 favorite in the field of 7, winner of the Golden Rod (G2) in November and making her 2018 debut here. In to challenge her included 3-1 second choice Africa, a close second in the Mizdirection Stakes at Aqueduct, and 5-1 third choice Originator, 2nd in an allowance at Churchill last out. Jockey Patrick Husbands sent 7-1 Closer Still to the front down the backstretch through fractions of 22.60 and 44.51 while pressed by 9-1 Sly Beauty and stalked by Africa. Turning for home, Sly Beauty gained the lead through 3/4 in 1:07.46, before tiring. Road to Victory, 5th early under Gary Boulanger, came through late to win going away by 1 1/2 lengths over Originator in a hand-timed 1:13.88. It was another 3 lengths back to 16-1 Magic Spell third. Winning jockey Gary Boulanger said, "I was never concerned. She's obviously nice and this is the shortest she's ever run, but I had worked her twice here since she's come back and she's acting better this year than she did last year. When I called her, she just surged underneath me and it was just like 'okay, let's go do this.'" Road to Victory is the only horse to defeat Monomoy Girl, winner of this year's Kentucky Oaks (G1) and Acorn (G1). Boulanger added, "I'm sure she'll be going to Saratoga, or something. She belongs there. She's a very special filly. She's acting better this year than she did last year. (Assistant trainer David Adams) said to just be confident, and don't get in a hurry. There's plenty of speed, and they'll come back to you. When I called on her, she just surged underneath me." 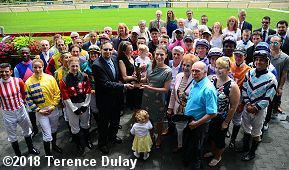 Emma-Jayne Wilson receives the Avelino Gomez award from Avelino Gomez Jr. surrounded by the Woodbine jockey colony, officials and her wife and twin daughters. 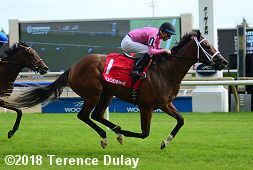 A tradition on Woodbine Oaks day is the Avelino Gomez Memorial Award ceremony. 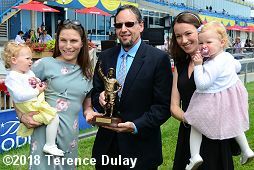 It is a lifetime achievement award given to a Canadian-born, Canadian-raised, or regular rider in Canada for 5 years, who has made significant contributions to the sport, with the winner receiving a replica of the life-size statue that overlooks the walking ring. 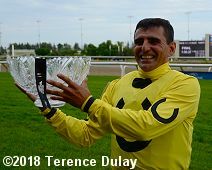 The Cuban-born Gomez died of complications after a 3-horse spill during the 1980 Canadian Oaks, and the award named in his honour is Canada's equivalent to the George Woolf Memorial Award in California and the Mike Venezia Memorial Award in New York. This year's inductee is Emma-Jayne Wilson, winner of 1,436 races and over $70 million in purses, the only female jockey to win the Queen's Plate (aboard Mike Fox in 2007), winner of the Pimlico Female Jockey Challenge in 2011, the Shergar Cup at Ascot in 2015 and the second female to win the Gomez award after Francine Villeneuve. Emma-Jayne Wilson, Avelino Gomez Jr., and her wife Laura Trotter, an equine chiropractor, with their 1-year-old twin daughters Grace and Avery. Choking back tears, Wilson said, "Given the spectacular legacy that Avelino Gomez was and the caliber of those who have been recognized in previous years, to be considered deserving of this award is an incredible honour. I am profoundly grateful for the opportunities that I have been given and I look forward to thanking those who have been instrumental in my career personally in the weeks to come. Thank you all for your support, your trust and the confidence that you have shown me throughout my career thus far. I am hoping to be back in the saddle as soon as possible." Wilson added, "It's been really tough. I've had major injuries in the past and they were usually near to the end of the year so you just take your licks and take your time and get ready for the next season. My injury happened the day before Opening Day, it was the morning, it was a fluke kind of shift and I came off and broke my arm at high speed. As of late, I have my iPad, my computer and my cell phone and all the different replay centres going so I'm just trying to keep in the loop and stay on top of things so as soon as [the surgeons] clear me, I'll be ready." Wilson joins Ron Turcotte, Johnny Longden, Sandy Hawley, Don MacBeth, Chris Rogers, Jeff Fell, Lloyd Duffy, Hugo Dittfach, Robin Platts, Larry Attard, Don Seymour, David Gall, Richard Grubb, Irwin Driedger, David Clark, Jim McKnight, Chris Loseth, Richard Dos Ramos, Robert Landry, Francine Villeneuve, Sam Krasner, John LeBlanc Sr., George Ho Sang, Jack Lauzon, Robert King Jr., Stewart Elliott, Emile Ramsammy, Steve Bahen, Mickey Walls, Patrick Husbands, Quincy Welch, Gary Stahlbaum and last year's recipient, Gary Boulanger, as Gomez honourees.